Before I go into this week’s fishing report, I thought I would give you a look into what we are doing over the next few months. 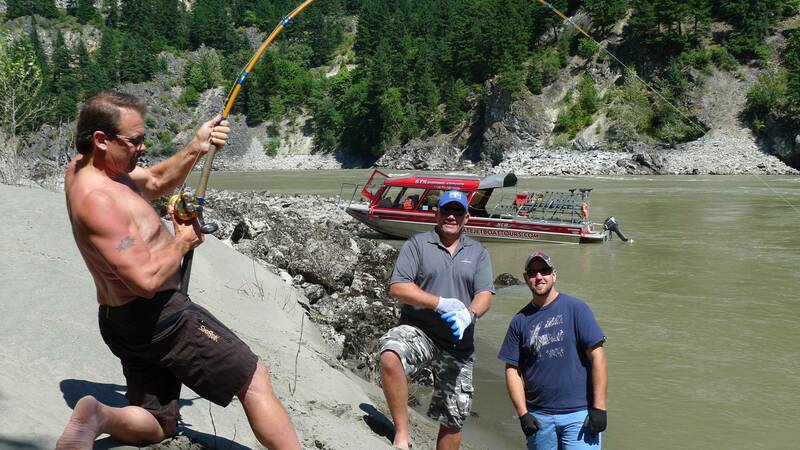 Right now, fishing in Vancouver/Fraser Valley is coming into some of the best salmon and sturgeon fishing you will find anywhere in the world. Our Sockeye Salmon was just upgraded to 7 million, we are expecting 17 to 30 million Pink Salmon and the Coho and Chinook numbers look to be strong. Fishing from now through to mid November is some of the best fishing you will experience anywhere. Availability – We still have some good dates available for the last 10 days of August, weekends are full but we do have week days available. We have a few selective dates open in September but we are about 90% Sold out until Sept 28. If you are wanting to experience some great fishing for both salmon and sturgeon in September, we have about 10 boat days remaining, these boats will go fast, in fact I did have 12 boat days available when I started writing this report. October offers some of the best all round fishing for salmon and sturgeon using many methods, we fly fish, spin fish, pull plugs, Plunk and bait fish. From Oct 15 to Nov 15 is what we refer to as the "Guides Season" We call it the guides season because we think this is the best time to fish our area, there are so many places to fish, we as guides love changing things up so it’s fun for us. We think this is the best season to fish our region. We still have some boats available for this time period so don’t wait too long to inquire or book. 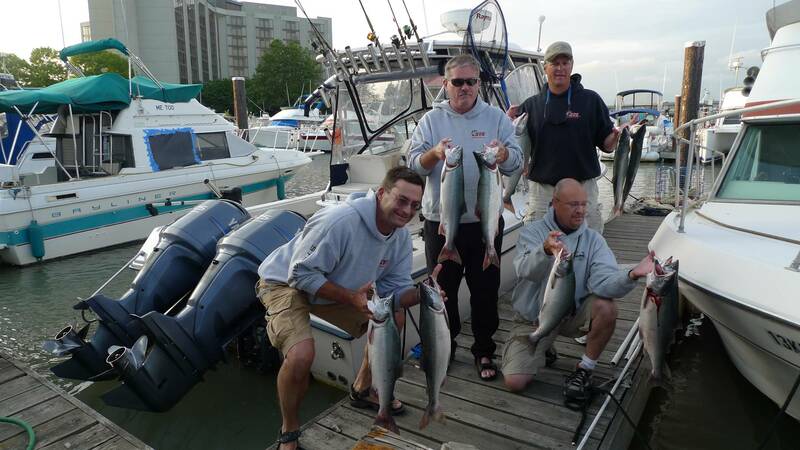 Fishing in Vancouver is starting to heat up, lots of options for species and areas. We are targeting West Vancouver for Chinook and Coho, Howe Sound for Chinook and Pinks, Fraser South arm for Sockeye & Chinook and throwing out our crab traps on every trip. Fishing has really picked up this week, we saw a large school of Chinook move through West Vancouver yesterday and sockeye fishing at the mouth of the Fraser was excellent. Sockeye fishing has been fair to excellent, each day is a bit different because these fish are on the move up stream heading for their home rivers in the interior. 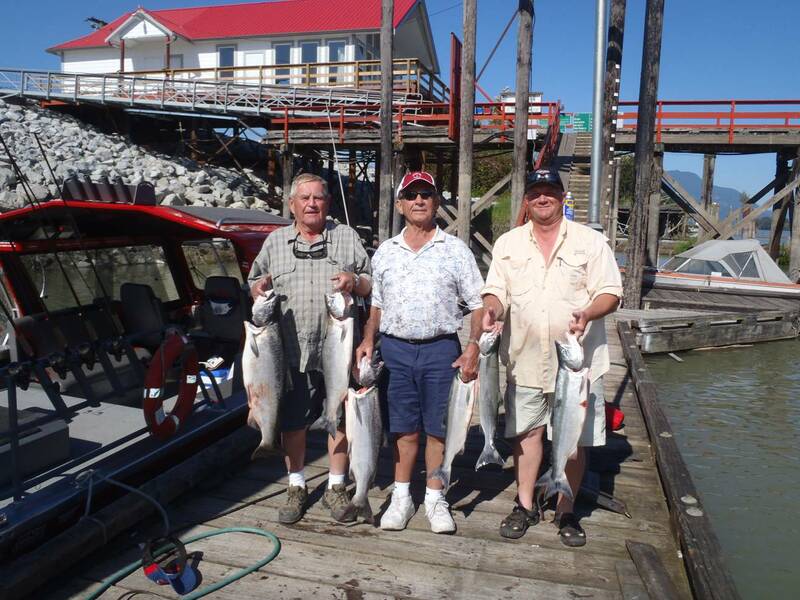 Yesterday one of our groups landed 3 Chinook and a limit of Sockeye in just a few hours of fishing. Since the sockeye run was upgraded to 7 million we decided to offer morning and afternoon trips. We will do this as long as the sockeye remains open. By the looks of things, we are now expecting this fishery to remain open until last week in August. 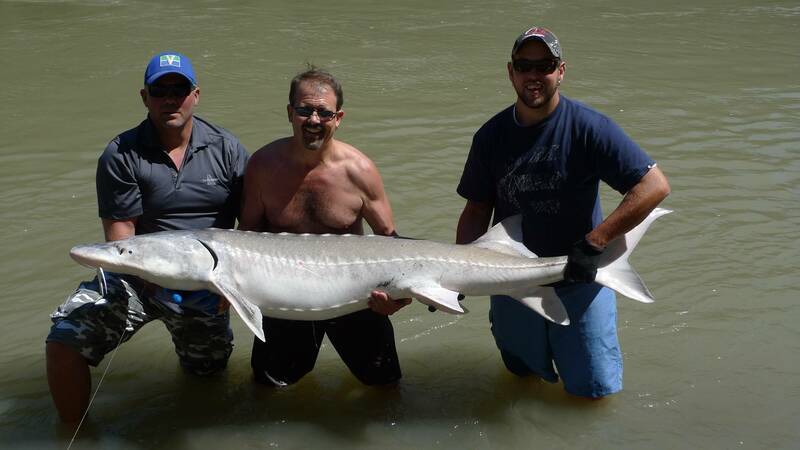 Fishing for sturgeon has greatly improved this past week, we have landed many fish over 7ft and battled a few over 8/9 ft. Yesterday I was so close to landing one of my largest fish of the season but unfortunately the fish had other ideas. 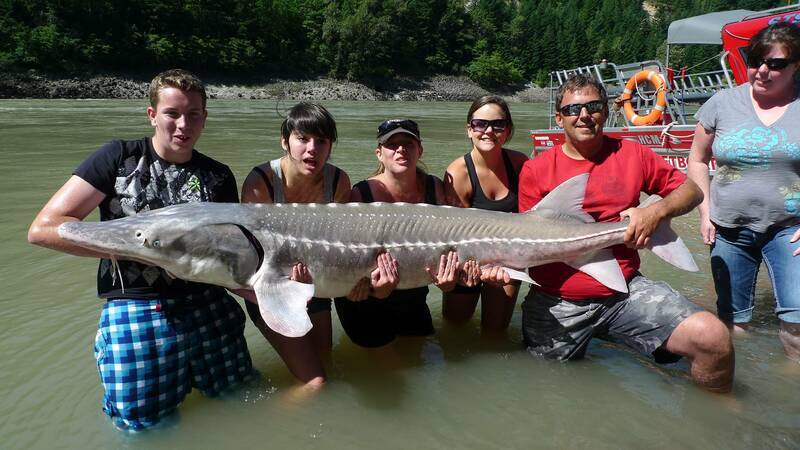 Sturgeon fishing will remain good and improve over the next few weeks. Best boat has been salmon eggs, gills, belly strips and just about anything that is related to Sockeye or Chinook Salmon. 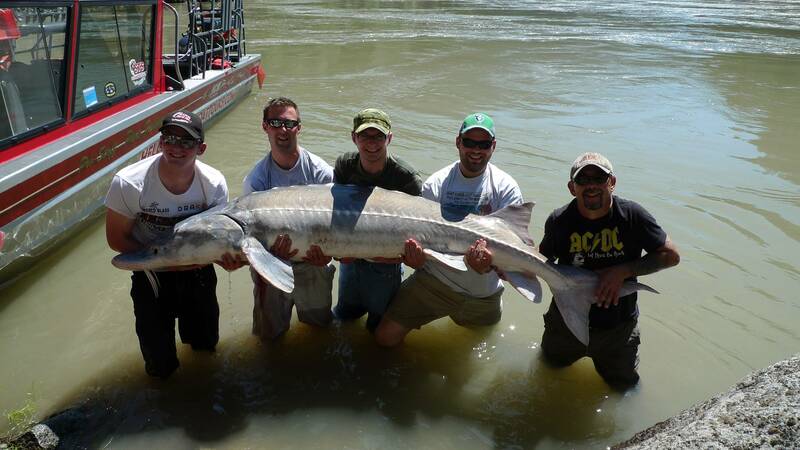 Have fun and enjoy some of the best sturgeon fishing in the country. We are currently fly fishing for trout and salmon on several rivers. Fishing has been fair to good, mostly small trout but now we are seeing the salmon moving in so fishing is improving greatly. over the next few weeks we will target Sockeye, Chinook, Pink and trout on the fly. Lots of river to choose from so just e-mail us and we can discuss your options. Our Jet boat tours into Hells Gate Canyon are running most weekends. Seats are going fast and we are now booking for the September long weekend. The only seats I have left are for Sept 4 at 9 am and 1:30 pm. Give us a shout if you are wanting to book a seat. I will be opening some dates for last two weeks in October when water will be crazy big. If you want to experience the canyon when it is at its meanest, this would be the time. I apologize for not updating this report Blog sooner but we have been doing double headers and having trouble finding the time. 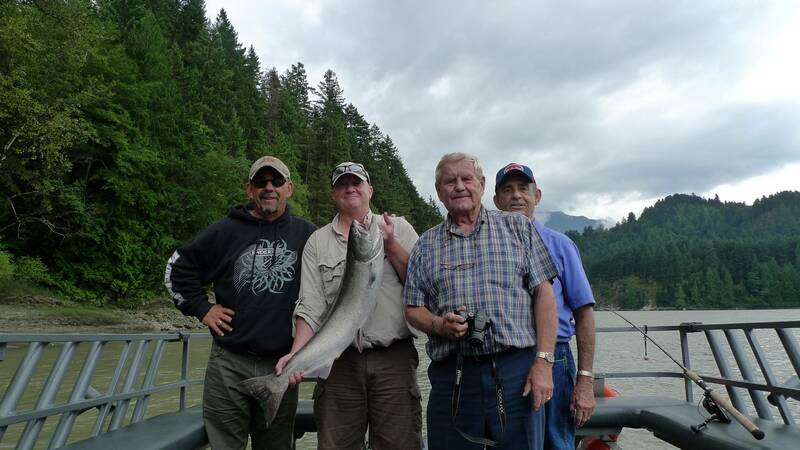 Once again, don’t wait to book if you are looking for October Salmon and Sturgeon fishing. Hope you have a great week and we will see you on the water. 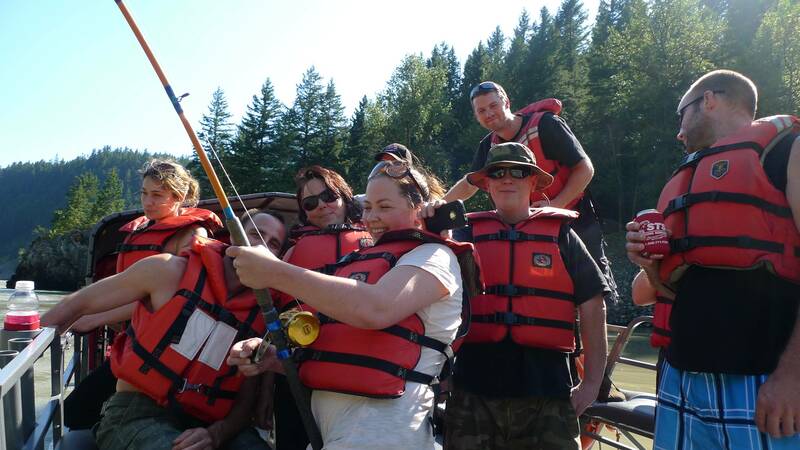 You are currently reading Fishing Report for August 17 at Hells Gate Jet Boat Tours Blog.